If you don’t hit that shape I’ll shot you. A bit dramatic I know. Look, do you find it easier to hit a shot that curves left to right (fade/slice) or right to left (draw/hook)? All the top professional golfers have a shot shape they prefer to hit and find it easier to hit. You might be thinking it’s all very well for a pro to be able to do that, they only move the ball one way or the other by a few feet. And while it’s true that’s most often the case, there have been pros that have moved the ball significantly in the air one way or the other. Two that come to mind are Bruce Lietzke who hit a big fade, and Bobby Locke from South Africa who hit big draws and even hooked his putts. Incidentally he was one of the best putters who ever lived. Now Bruce Lietzke is an interesting professional golfer for the average once a week golfer to look at, because he hardly ever practiced. But when he did play he knew that every shot was going to curve from left to right. Is it possible to hit a straight golf shot? Yes, but barely possible. Jack Nicklaus said he only hit 3 straight golf shots in his career. Is it possible to hit every shot with some curve to it. 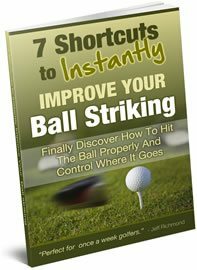 So if you want to improve your consistency of ball striking you need to figure out what the one shape of shot is that you can hit with a gun to your head, and stick to it no matter what. For most golfers that will be a shot that curves from left-to-right. And that’s a shot shape that can produce great results with very little practice… like Bruce Lietzke has proved. But you will most probably need to work on reducing the spin. To do that there’s two main factors involved, which are path and clubface alignment at impact. In a future article I’m going to discuss at length those two factors and how you can work on them to control the spin on the ball. 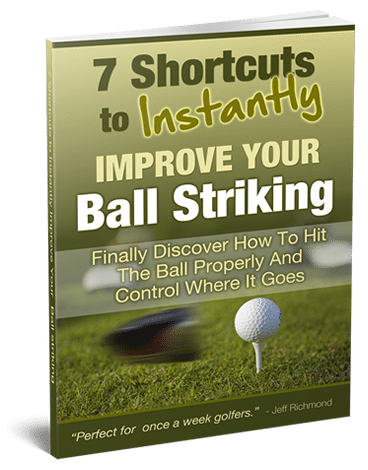 In the meantime, work out one shape of shot that is easier for you to hit and stick to it and master it, so on any hole and shot you know you can curve the ball one way.